If you feel a strong sense of spiritual vocation—a desire to devote yourself to fully to truth or God—but don’t want to live in a secluded monastery, physically and mentally isolated from the modern world, then becoming an Integral Urban Monk might be a wonderful option. But how does one do it? What is required, practically speaking? Here we will present not rules, but our humble recommendations for how to become an urban monk, of the integral type. These recommendations are designed to empower your vocation, making possible the attainment of your highest spiritual aspirations, all the while interfacing harmoniously with the contemporary urban situation. when they live by the labour of their hands." a. A stable source of income. As an urban monk you’ll want to be able to focus wholeheartedly on your spiritual life. What you probably don’t want to do is to worry constantly about whether you’ll be able to eat, stay warm, pay the bills, etc. To this end, we recommend that you find a stable line of work, which will enable you to live your life without worldly worries and without having to depend on someone else’s kindness for financial support. b. A relatively stress-free line of work. Since as an urban monk your main priority in life will probably not be the accumulation of wealth, your work doesn’t necessarily have to bring in a lot of money. Therefore, when considering your occupation, it should not be a choice based primarily on monetary gain. Instead, we recommend a line of work that strikes a careful balance between what we call stimulation and unconstraint. It should be stimulating enough so that you do not wake up in the morning feeling despondent about going to work. And it should be unconstrained enough so that you don’t have to worry too much about job responsibilities. Ideally, your work should be such that you go there in the morning (if you work in the day time), engage completely and enthusiastically with your tasks during these hours, and then when the work day is over, you’re able to completely let go of all job commitments. Indeed, many people keep working even as the actual work day is over; they keep going over duties, meetings, deadlines, responsibilities, etc. in their head long into the night, often resulting in much anxiety and unease. Since each person is different in how they relate to work, we of course don’t hand out pat answers on good types of jobs for urban monks. You’ll need to find your own balance between how much stimulation you need from your job, and how responsibility-free (unconstrained) you feel you need to be, so as to enable a stress-free and wholehearted relationship with your spiritual life. c. Your own place to live. By this recommendation we mean that you shouldn’t live at home with your parents, or in a place which you couldn’t pay for with your own means. We feel that a relatively independent worldly situation is important, ensuring that we needn’t worry about, or be constantly distracted by, various interfering external factors. At the heart of a monk’s spiritual life is the shift from self-centeredness to selflessness. To ensure that one dwells within this monastic spirit, it is by most monasteries required that one takes some kind of vow, simply as a token of one’s sincere commitment to this way of life. 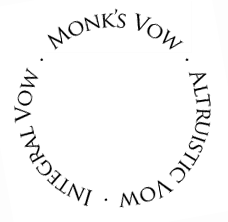 As urban monks of the Integral Monastery, we recommend taking what we call The Three Vows: the Monk’s Vow, the Altruistic Vow, and the Integral Vow. The first vow is the basic monastic vow, which one more or less will share with all monks across the globe, regardless of religion or type. The second vow is a vow which will ensure a monastic life free even from the most subtle kinds of self-centeredness. The final vow relates specifically to urban monkhood and means that one as a monk will be capable of adapting harmoniously to a wide range of life situations. 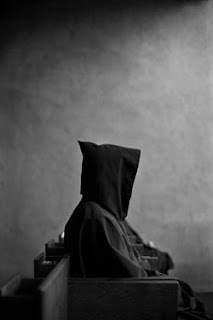 The home—or cell, to use Christian terminology—of the integral monk should preferably be arranged in such a manner as to invite an atmosphere of contemplation and silence. Many traditional monasteries usually avoid excessive decoration, cluttered environments, bright colours, and so forth. We feel this is a good guideline also for urban monks, as environments that constantly stimulate one to engage in distracting thoughts and activities will, for many, disturb the monastic life. That said, certainly what is distracting to some is not distracting to others. And some, because of aesthetic preference, would perhaps rather organize the home in a more extravagant fashion. So again it’s necessary to reiterate that these guidelines are merely recommendations ‒ every monk is always free to express herself in an unobstructed manner. Also, the home of some—most?—urban monks might be very compact. In these cases it may seem hard to organize in a monastic spirit. However, this is not a problem. 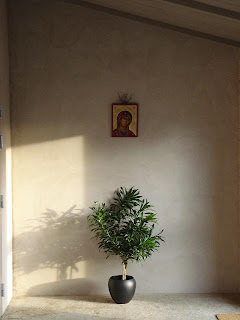 For we are not speaking about interior design per see, but rather about the cultivation of a sense of spiritual direction: an urban monk should within the life situation he finds himself in, simply aspire to decorate the home in a monastic manner. To some, these home reorganizations may involve considerable changes. For others, it may simply entail buying a candle or removing a piece of excessive furniture. In order to accentuate the significant interior commitment one has made in becoming an urban monk, an exterior and tangible change in the form of a monastic habit—i.e. a monk’s garment—might be used. Furthermore, a monk’s habit may serve as a helpful tool in encouraging and reminding one to engage in spiritual practice. The practical use of the habit is to be decided by each monk individually. Some may want to wear it constantly (apart from work). Others will choose to wear it only privately, inside the home. Some, perhaps, won't feel like wearing one at all. 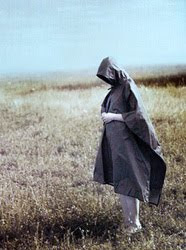 While a monk’s mental shift, from self-centeredness to selflessness, of course is what matters most, few things highlight the actual feeling of being a monk better than the physical act of putting on and wearing a monastic habit. An integral monk chooses his own habit. Or he may band together with other monks and share a common kind of habit. The final practical step in becoming an urban monk has to do with various lifestyle choices. Again, this will be very personal for each monk. For example, some might decide against having a television, as it may prove distracting. Others may decide to become vegetarians. Others may pick up a hobby or discipline like tai-chi, gardening, painting, choir, a martial art, etc. Others may decide to join a soup kitchen to provide for the homeless. Others may start taking long walks in nature. While it is not necessary to change one’s life in a radical way just because one becomes an urban monk, we nonetheless recommend that one at least contemplate how the monastic vocation will practically manifest in, and influence, the way one lives. As for what lifestyle changes are appropriate, we suggest choosing by keeping in mind the 6 shared goals of the Integral Monastery. With that, we wish you good luck in your monastic life, and hope you'll find these recommendations worthwhile. Maybe we'll talk soon. Peace! These recommendations of course are not absolute or final and—if appropriate—will be subject to revision and update.